There’s just something about the adorable questionably-cat, questionably-human creature Hello Kitty that has girls and boys clamoring for Sanrio pencil cases and backpacks well beyond an age most would consider appropriate. Well now there’s fantastic news for fanatics of the cute cartoon: Sanrio will open a Hello Kitty Mini Cafe in the Westfield Santa Anita on Friday, April 7. This isn’t the first time the Hello Kitty Cafe has popped up in Southern California, as a roving truck has activated everywhere from Torrance to Glendale and a pop-up container opened in Irvine Spectrum last year. The Westfield Santa Anita cafe, however, is much more than a temporary installation. The pink and white structure features pastry cases and plenty of merchandise for the kids yourself. On the menu are adorable pies, tarts, cookies, pastries, and cakes alongside hot and cold beverages to wash it all down. Ultimately, it seems like quite the place to duck into for a mid-shopping pick-me-up, or a sweet treat after a meal at one of the mall’s standout dining options. 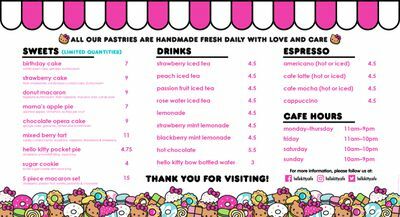 This weekend’s grand opening are Friday from 11 a.m. to 10 p.m., Saturday from 10 a.m. to 10 p.m., and Sunday from 10 a.m. to 9 p.m.
“Squeal Alert: Hello Kitty Opening Permanent Mini Cafe in Westfield Santa Anita.” Eater LA – All. http://la.eater.com/2017/4/6/15212464/hello-kitty-mini-cafe-westfield-santa-anita.